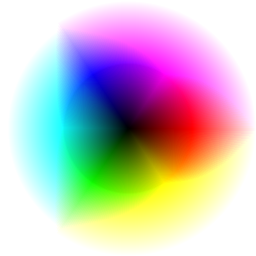 This is color wheel. It’s not the model you usually see when talking about color theory. It’s organic and restful. I want to stare at it for a long time. A model of the relationships of color. Simply put this tool can simulate color deficiency and provide information on contrast/difference and brightness work for viewers with inability to see color spectrums. It helps with the following color sensitivities: deuteranopia, protanope, tritanope. ” This is iGuy. 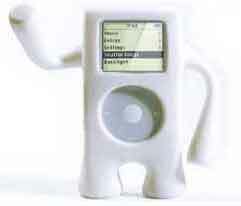 Bendable and Apple iPod white; who could imagine a more frivolous toy. Turn your iPod into a posable toy. Gumby has color not the case with iGuy. So is this the child of Gumby and the Pillsbury Doughboy? This one of many products brought to you by Speck Products protectors of your mobile devices. Their line Skin Tight will keep any number of smart phones and PDA’s from scratches and dings. I have to admit I didn’t find this in my travels. My bud Peter found it and turned me on to it when we were iChatting. I also have a copy of Bruce Mau‘s Massive Change in my Yak Pak. I’m trying to recall the first time that I heard Bruce Mau speak. I think it was in he had just finished SMLXL with Rem Koohaus (1996). I heard him speak again in 2ooo on a book tour for the release of Life Style. Massive Change revisits many of Buckminster Fuller’s thoughts on our world. You can take a look at The Buckminster Fuller Institute to see his thoughts in action today.